A bit of a cheek, I know, but here are two more unmarked patterns, which have completely flumoxed me. They are in the Museum of Cambridge. Cambridge is on the edge of the Bedford lacemaking area. 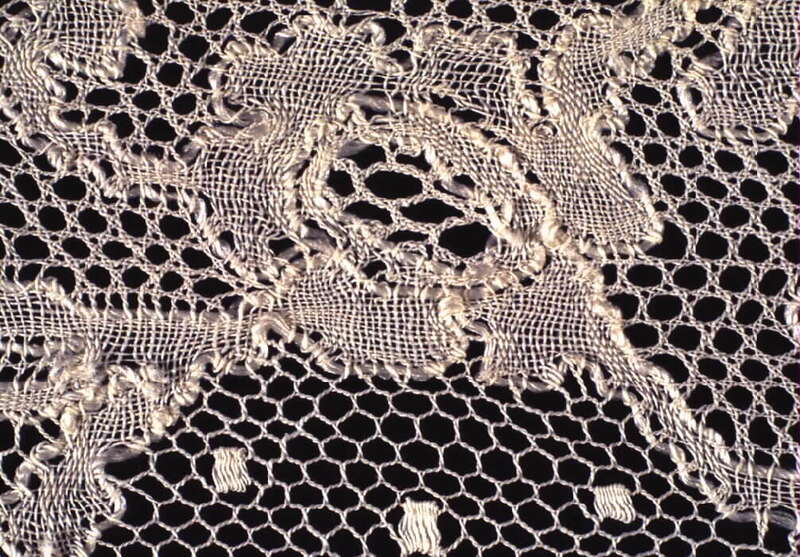 However, the local museums show a range of different styles of lace, Beds, Bucks, Torchon, and a mixture of styles. So that doesn't help! 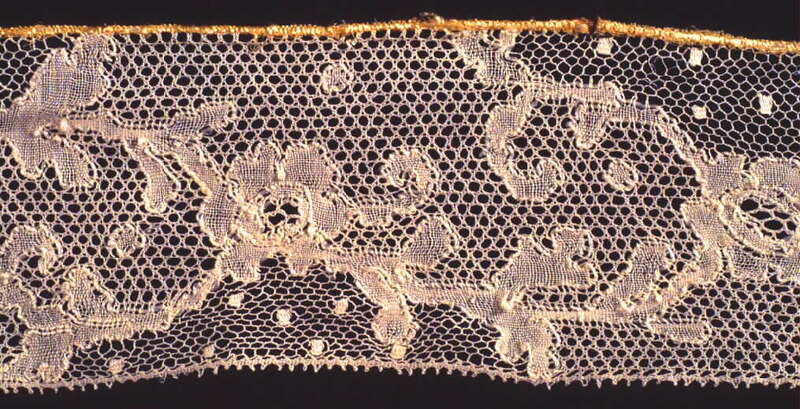 (And the museum doesn't know much about lace, so I suspect this could have come from anywhere!) I'll post these as two messages. The first is clear, and I have various ideas, but I don't know if they're right. The headside - perhaps a Cluny style headside? Diamonds? Then a row of not quite diamonds because they've missing the points... But what really worries me is the difference between the ground on the right, and whatever is round the "diamonds". And is it a Bucks Point style grid, or a Torchon grid? That might provide a clue... Any possible designs would be welcome. Here is the second. Not clear, I'm afraid (it was in a glass case). But looking carefully, it seems to have ground on left and right, and further spaced holes in the centre. So two types of ground? But what would suit? Wow..whatever they are, they look to me like that might have been used a lot and maybe with a larger pin too, or just more open because of use. Just guessing, but it looks like a place where they put their braiding. I think that's the right word. Yes the difference in size between the ground near the footside and the ground near those "diamonds" is a problem. The only thing I can think of is kat stitch ground, where you only put a pin under the top stitch of each kat st unit, as the red dots in the photo below. Flanders ground would also have only 1 pin for 4 pairs, but I don't think English lacemakers used that ground. They would have used a torchon grid to make rose ground. Same movement of threads, but the pin placement determines how spaced out the threads are. I think kat stitch is more likely. A Cluny edge would not make sense with a kat st ground. Something with a picot edge is more believable. There are 2 vertical rows of roundish spots, and one vertical row of diamond shaped spots. Could the roundish ones be honeycomb rings with more than the usual pins? The diamonds could then be cloth stitch diamonds. Spiders wouldn't make sense with kat stitch ground. But I admit to being baffled. On your 2nd one, the flattened diamonds of the ground suggest point ground. The units near the center with larger blank areas could be cloth or half stitch spots, possibly tallies. But I need to see it right way up. My neck won't bend far enough left to get a good angle! Here you are! Looking at it, I wonder if the centre is honeycomb (or Kat stitch) with the edges being Bucks point ground. (The grid suggests that we are in Bucks Point territory here). But that seems all wrong with what I know of Bucks Point! Too linear.. I'm assuming that the choice is Beds/Bucks/Torchon. And I feel some type of Bucks suits the general style (and grid). Bucks could do clothwork blobs, couldn't it? I'm thinking half stitch for the round ones and cloth for the big ones (or vice versa). The main thing that worries me and I'd like some expert advice on - is it reasonable to mix Kat stitch and Bucks point ground in the same piece? For a Bucks Point design? As for #2 even right side up I can't make heads or tails of it. But torchon seems more possible. There may be stacks of tallies in diagonal rows near the center of the piece. Oh of course, I forgot about the gimp! That makes sense.... Maybe think along those lines. I'd probably end up with something that wasn't the original, but might be fun. As for the other one - as you say, it's such a mess. I wonder how anyone could use such a pricking even if she knew the pattern well! Here is my attempt at a reduced version of the first one. The left edge is repeated on the right of the diamonds, of course. But that made it too many bobbins for my liking. It's a very short repeat, which would be a bit boring to work with the two sides being similar! That looks like a probable and realistic interpretation. Well done. I have an idea for the second one, quite different from yours, I think. I've tried marking up the pattern. I see Kat stitch or honeycomb in the middle, and Bucks point net each side. A bit weird, no clothwork or gimps - just these three strips of ground. I've going to try doing it (or a narrower version) to see how it looks.